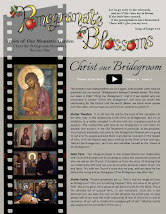 A reflection by Mother Cecilia, originally published in Horizons, the newspaper of the Eparchy of Parma. 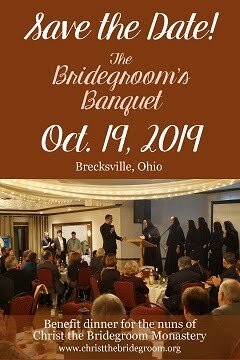 Through the sponsorship of a benefactor, the nuns of Christ the Bridegroom Monastery made a pilgrimage to the Holy Land, organized by the Melkite Eparchy of Newton, this past July. 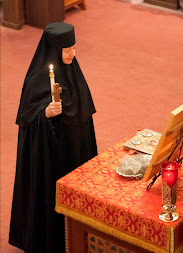 It was the first time in the Holy Land for most of the nuns of the monastery. On the first full day of our pilgrimage, my amazement grew as each new site increased in importance. I was in awe when we visited the place where some of the prophets are buried. Then we visited the place where the greatest of the prophets, John the Baptist, was born. As we approached the place of the birth of the Messiah — of God on earth — I simply didn’t know what to think. 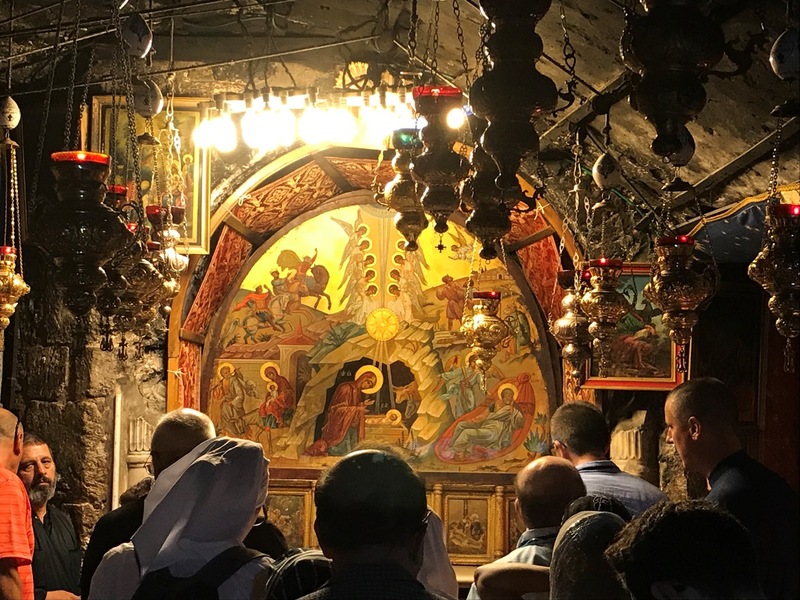 In Bethlehem, we went first to Shepherd’s Field, where the angels announced the Good News of Christ’s birth to the herdsmen. We walked through the ruins of a monastery that existed during the Byzantine period. After lunch, we arrived at the Church of the Nativity. It is one of the oldest churches still in existence. The doorway is very low, so that visitors must bow in order to enter. Underneath the church is the Grotto of the Nativity, where the place of Jesus’ birth is marked with a metal star on the floor. 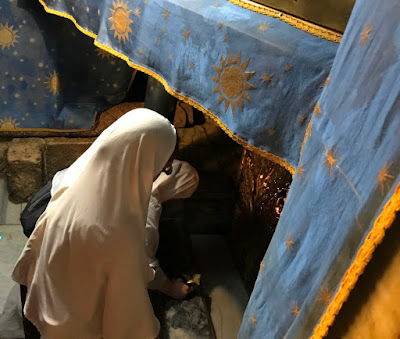 Nearby, in the same chapel, is the place where Jesus was laid in the manger. 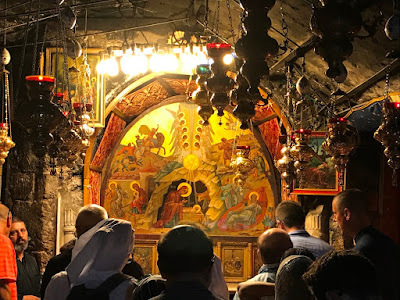 We listened to the chanting of the Gospel and then venerated the place of the Nativity as we sang the Troparion of the Nativity. I was overwhelmed and nervous to venerate this holy spot, especially as we were being urged to move quickly. As I kneeled down and leaned over to kiss the star on the floor, my metal water bottle fell out of the side pouch of my backpack and crashed loudly on the marble floor near the star. Someone picked it up for me. I tried to touch my chotki to the star, but because it was attached to my belt I couldn’t reach it there. I awkwardly got up. I quickly understood that Jesus was allowing me to be humbled in the very place where he humbled himself by becoming man. At that moment I began to relax. The places I visited in the Holy Land were not actually foreign to me. I had already experienced these mysteries interiorly, in the liturgy, and in the mysteries of the church. As I look back on the experience of our pilgrimage, I realize that I didn’t need to figure out how to think or how to pray. God was giving himself to me, and my job was to open to receive him. This is what he continues to do in every moment of our lives. During this Feast of the Nativity, may we humbly accept our weaknesses, allowing them to be places where Jesus lays down in us so that we can give him to the world. I spent a year in Israel/Palestine, on sabbatical. I chose not to take any courses but simply to allow myself to wander around, read, pray, and absorb the experience. 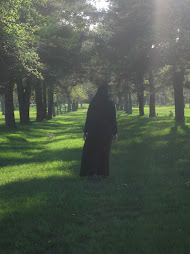 I love the reflections you have published here about your experiences on your own pilgrimage. They remind me and rekindle in me some of the longing and fulfillment I felt there, and how to continue to live out those experiences. Thank you, thank you, dear Sisters. We're glad that you are enjoying the reflections. Wow--a whole year there! You must have a lot of stories! Thank you for taking us with you and giving us a lovely taste of spiritual inspiration. Being disabled and poor, with no patron to fund pilgrimage, descriptions such as yours are my only access to an experience of these holy places. I hope you will share with us again!